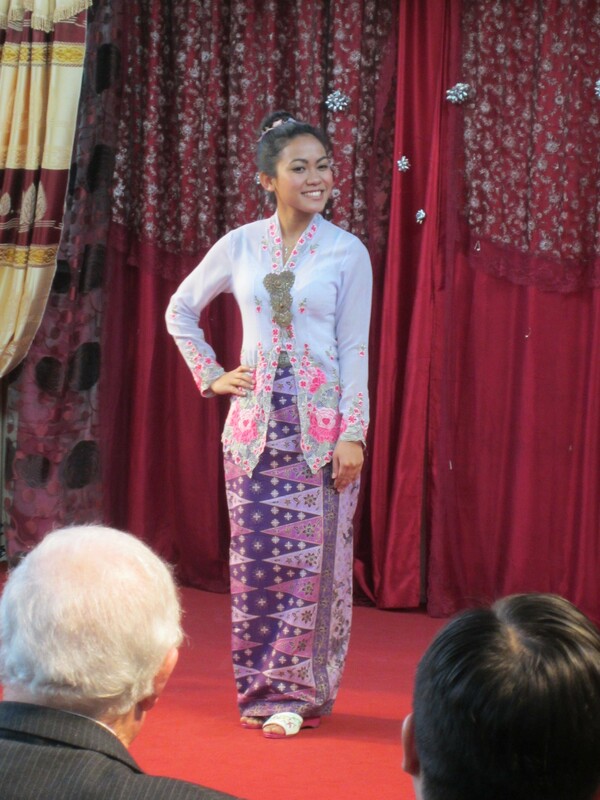 A look at Nyonya attire, jewellery, shoes, practices and anything else you want to see! Please take a few minutes to browse through the pages that are already up and let me know what you think! You can send a message via the website. I’d love to hear from you! Video Messages to Tempt You With! In this short blog-post I’ll share two videos of me. Those of you who also follow me on Twitter or my Facebook Author Page may already have seen these – they were shot in my home library. The first video is a simple but heart-felt Thank You to people who’ve already read and loved The Woman who Breathed Two Worlds, my debut novel (Book #1 in the Malayan Series) which follows the life of a courageous woman in British Malaya. In the second video, I read a short excerpt from the book. Family, food, friendship and identity are key themes and this video contains pictures of the delicious kueh (or cakes in Malay) that are integral to the story, as well as images of old Ipoh, the town in which the story is set. 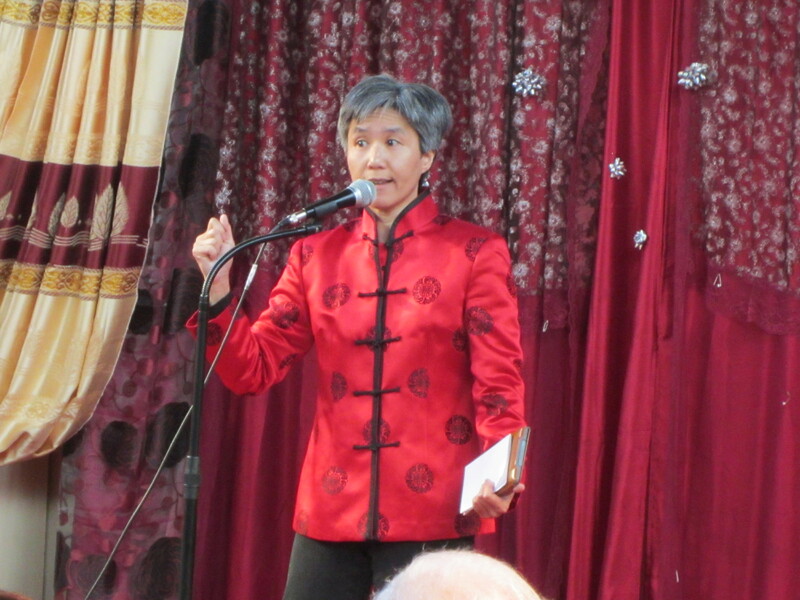 Thank you to Cafe Rasa in Stratford, London, for supplying the kueh shown and to Dr. Ho Tak Ming for allowing us to use images from his book about Ipoh, When Tin Was King. If you haven’t yet read The Woman who Breathed Two Worlds, I hope these videos will spur you on! Thank you for watching and for reading! NB At the time of writing, all the above stores have my book in stock. There is a road in the Greentown area of Ipoh, Malaysia, which is named after my maternal great grandfather Chin Choon Sam. He was the husband of the woman who inspired my first novel. Chin Choon Sam was also the father of (among others) the late Chin Kee Onn. Chin Kee Onn in turn was the author of Malaysian classics such as Malaya Upside Down – the first non-fictional account of life in Malaya under Japanese occupation (from December 1941 through September 1945) and Twilight of the Nyonyas – a fictional tale of a Nyonya family in the early twentieth century, a period of decline for this mixed-race community (of which more below). 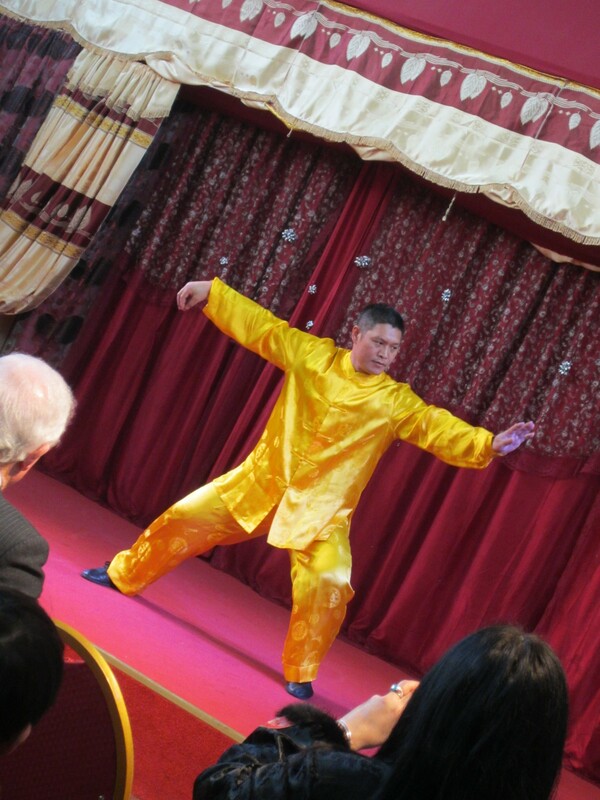 Not much is known about Chin Choon Sam other than that he was an educated man who came from a Hakka village in southern China. Great Grandfather arrived in Malaya at some point towards the end of the nineteenth century and apparently set himself up as a roving accountant to Ipoh’s first entrepreneurs. He didn’t become a millionaire but he did well for himself, so well that he decided to settle in Malaya. By all accounts, my great grandfather loved his adopted home. He already had a wife in China, but Chinese immigration policy was such that women were not allowed to leave the country in the same numbers as men. In order to put roots down in Malaya, Chin Choon Sam took a local woman as his second wife. He chose a woman from the mixed-race Nyonya community who was shrewd, blessed with a fiery tongue and who delighted in feeding him eye-watering, spicy dishes. Who exactly were the Nyonyas? Unfortunately, many people today, even in Malaysia, don’t know the answer. This is in large part because the Nyonyas (and their male counterparts, the Babas) do not fit into the political narrative which the Malaysian government and its ultra-zealous supporters would like us to espouse. The dominant narrative in today’s Malaysia holds that the country was “first” inhabited by the Malay people who, by dint of having arrived “first”, deserve “special privileges” – first priority in the civil service, education, public scholarships, land purchases and financial hand-outs. Protection for the rights of this privileged class is enshrined in the country’s Constitution (which incidentally, was generously agreed by our wonderful British rulers prior to their departure). Moreover, because the Malays converted to Islam sometime between the twelfth and the fifteenth century – a religion brought by traders from India and the Middle-East – it necessarily follows that all Malays born today in Malaysia are Muslim. It must be so, how could they possibly be anything else? There are some who would like us to believe that it has always been this way in Malaysia: that every person of Malay descent has been incontrovertibly a Muslim since the twelfth century. Alas, the Nyonyas are thorns in the above narrative. Here were local Malay women marrying immigrants from China and then proceeding to adopt some of their husbands’ customs, including, crucially, their religion. 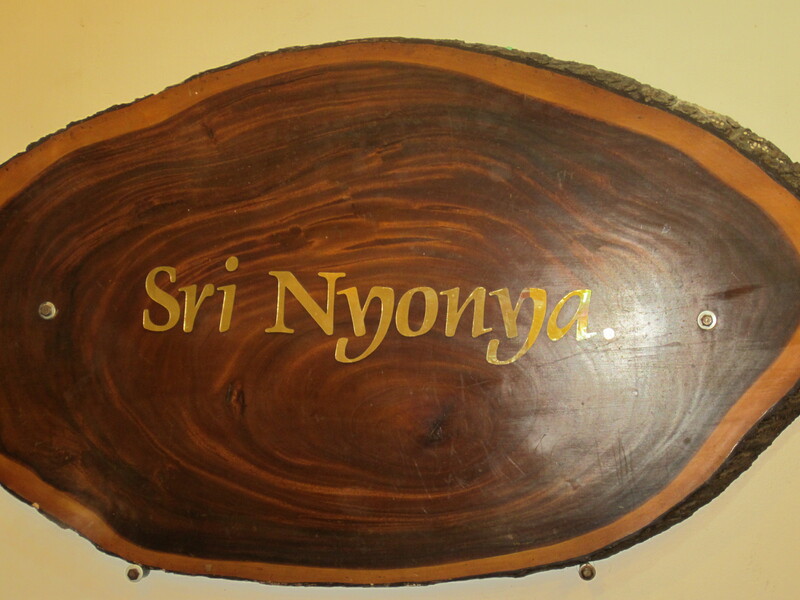 Instead of practising Islam, the Nyonyas adopted Buddhist-Taoism. Worse, Nyonya and Baba communities were established along the coastal parts of Malaya from the fifteenth century onwards. In other words, a sizable Chinese community began settling in Malaya six hundred years ago – a very long time ago by anyone’s standards. If it were not so, Nyonyas and Babas would never have come into being. The existence of Nyonyas and Babas is rather inconvenient. Should their descendants (people like me) not also deserve “special privileges”? For how many generations do your forbears need to have been around before you enjoyed such privilege? This question is best avoided, otherwise Malaysia’s racial policies would be shown up for the poisonous, antiquated trash they are. Therefore, instead of celebrating an interesting part of our heritage, the Malaysian government chooses to ignore it. Evidently, parts of Malaysia’s history cannot be publicised – it would give the citizens ideas. The Nyonyas and Babas point to a time (not even that long ago) when Malaysia was actually liberal, when the Department for Islamic Development (JAKIM) did not exist and there were no officials lurking to poke their noses into people’s daily lives. It was in that age that Chin Choon Sam married a woman from the Nyonya community. They had nine children together: three girls and six boys. To cement his position in Malaya, Great Grandfather invested in seven plots of land in Ipoh, my family’s hometown. He would have bought them sometime in the first decade of the twentieth century, when Ipoh comprised barely more than a few streets. 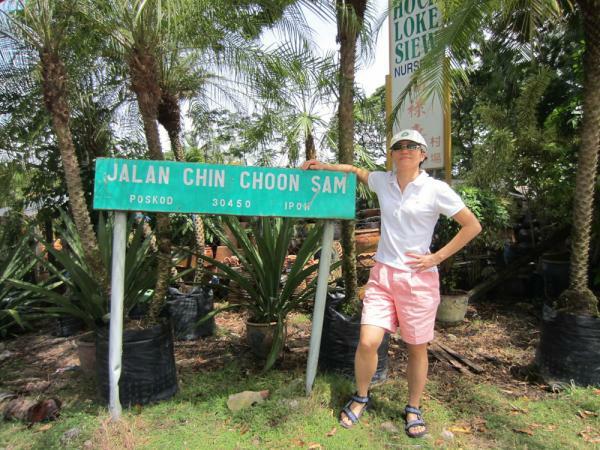 Of all the places in Ipoh, Chin Choon Sam chose to buy his land in Greentown. Greentown then was not the thriving metropolis it is today. It was actually a bit of a wilderness – far from town, full of rubber estates and mosquitoes. To say that Greentown had uncertain prospects would have been generous. Most people must have thought Great Grandfather mad or very foolish, which is why he probably acquired his seven plots for a song. Why only seven plots, you may ask, when he had nine children? 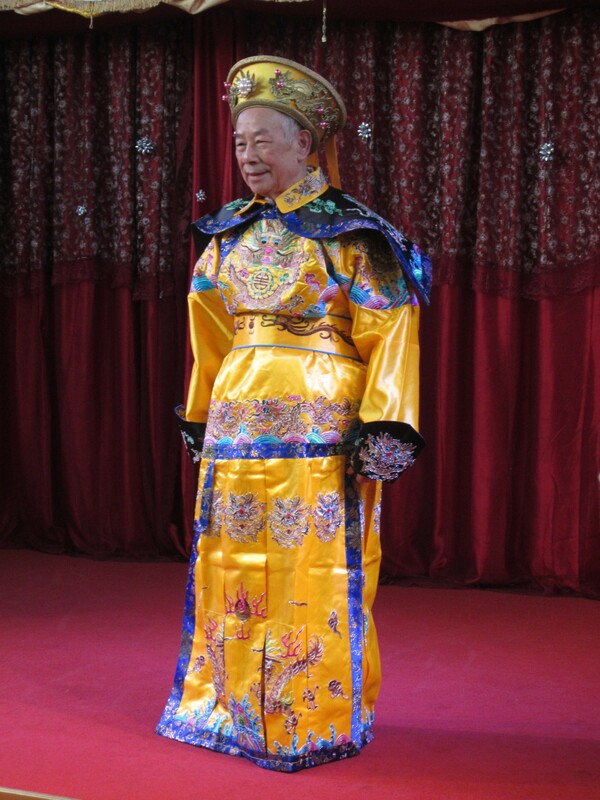 Because my great grandfather, as typical of any Chinese man of the time, was thinking only of his sons. Each son would need to build his own house, while it was assumed that his daughters would marry and be provided for by their husbands. But there was one extra plot. This, Chin Choon Sam donated to the Malay community specifically so that they could build a mosque. The only mosque in the area is the Masjid Muhibbuddin Shah (Masjid meaning Mosque in Malay) on Jalan Abdul Jalil. It’s close to where my family used to live and is very likely to have been built on Great Grandfather’s seventh plot. In those days, gestures of friendship between non-Muslims and Muslims were uncontroversial. My great grandfather’s donation was welcomed and a little road in Greentown was named after him. Contrast that with what happened in Malaysia last week, when plans by the Democratic Action Party (DAP), an opposition party, to build a mosque, were condemned as an “insult” to Muslims because funds for building mosques had to be “halal”. The DAP, despite having Muslim members, is conveniently branded a political party of and for Malaysian-Chinese, who are of course not halal. My great grandfather’s desire to pay homage to his adopted country was natural and highly laudable but I wonder: would his gift have been accepted now? In the sorry state that is today’s Malaysia, I suspect not. To Malaysian Readers: I do know that Article 153 of Malaysia’s Constitution safeguards the position not of Malays per se but of “Bumiputras“. The definition of Bumiputra – a Prince of the Soil, a protected class of person in Malaysia – is convoluted though, and not relevant to this blog-post. Article 153 is a minefield in Malaysian politics which would require separate discussion. It is a wonderful time to be in the New Forest (the brown blob at the bottom of the map). The New Forest lies in Hampshire, and is now one of England’s national parks. In early October the trees are still green, but the oranges and gold of autumn have crept in. 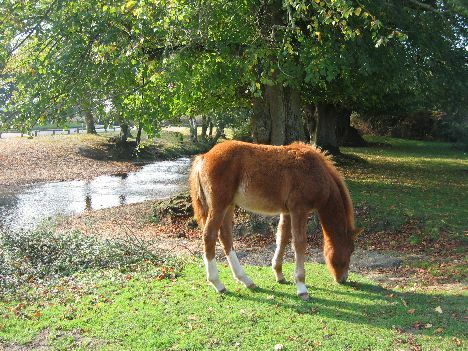 Ponies meander in open fields; along the streets of Beaulieu village, famous for its National Motor Museum, wild donkeys poke their curious nozzles into the doorways of shops. It was in this pastoral setting that I gave a book reading on the evening of October 3. I had been invited by Monty’s Book Club, whose members meet once a month in the Montagu Arms, a pub and hotel located in the heart of Beaulieu. The club reads the whole range of literary fiction, from contemporary works through to classics. This book club has existed for three years and is thriving; it even has a waiting list. Membership is restricted to ten at any time, because the club borrows books from the local library and ten was felt to be a manageable number. A member told me the size is just right, as it allows for varied discussion without being intimidating. 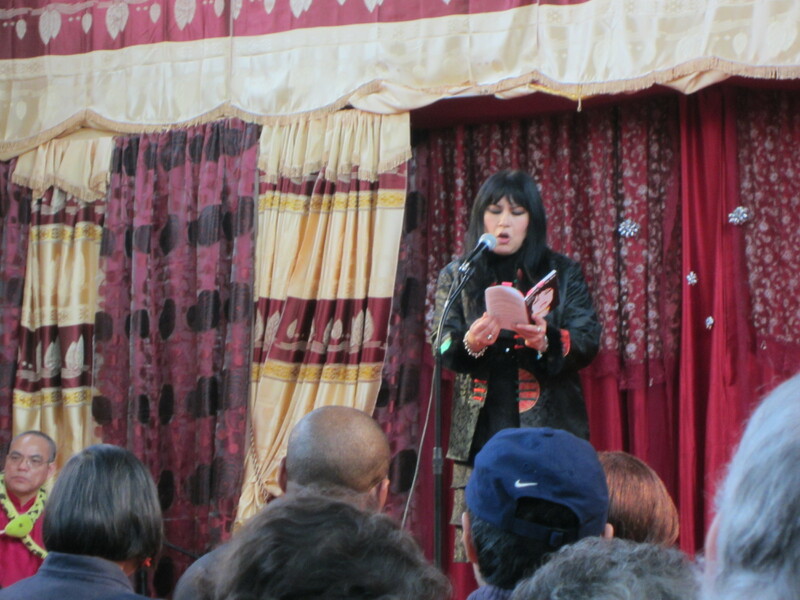 I was only the second writer to read to Monty’s, the first being Natasha Solomons. To publicise her debut novel Mr Rosenblum’s List, Ms. Solomons went on a quest to visit as many British book clubs as she could. She duly arrived in Beaulieu. There, she paved the way for others, because her reading was such a success that Monty’s members welcomed me too. My own invitation came about through personal links. During the six years I spent at SouthamptonUniversity as a theoretical physicist, I often sought refuge in the New Forest. I loved its peace, its trees and the colour of its skies. I still visit, to see a long-standing friend whenever I can. On one such visit in the summer, I heard about Monty’s Book Club, and wondered aloud whether the club would be interested in a reading of my novel. The club said yes. Like Ms. Solomons’ reading, mine was also to be a special event, held not in the Montagu Arms but in a member’s house. I arrived with some trepidation. I had never given a book reading before and didn’t know what to expect. I knew the atmosphere would be genteel and its members polite, but I didn’t want people to say nice things just because they felt obliged to. If anyone became bored during the half hour or so while I read, it would have been obvious to me – and the rest of the audience. So I practised, many times. I recorded my voice on a sleek, silver Olympus recording machine my partner had given me as a present. It’s a fabulous gadget: pocket-sized yet powerful. On it, you can hear everything, even the rustle of paper. I listened to my enunciation, making sure there was enough nuance in my voice to keep everyone’s attention. I learnt to pull my stomach muscles in when my voice fell, so that I could better project sound across a room. I imagine that this is what singers have to do. 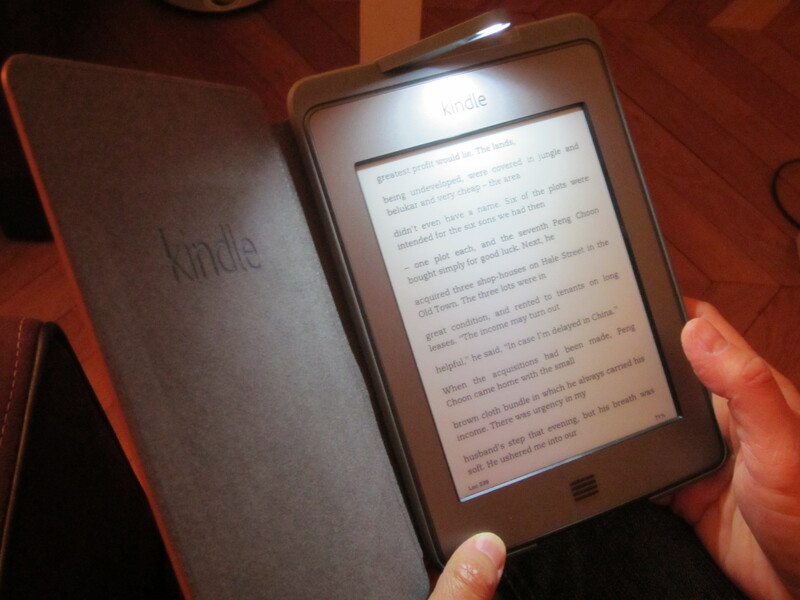 I read from a Kindle reader with a special leather cover that has its own discreet lamp at the top. The light flicks in and out; it can be fully tucked in unless needed, a highly ergonomic design. Much as I love holding a physical book, I also love my Kindle and its cover. Its leather feels wonderful in my hands, and the fact that its light shines directly onto the page is a huge bonus. The Kindle proved incredibly useful during my reading. In the end, I read two sections, one short, the second longer. The first was the ancestral story of the Nyonyas, the people from whom my main protagonist, Chye Hoon, is descended. I looked at my audience as I read, watching for any sign of a yawn or of eyes glazing over. None came. I could see that the members of Monty’s Book Club were imagining the scene in their own minds, seeing the character in my story who is herself telling a story. When I began the second, longer section, the eyes of my audience were still on me. The scene takes place on the island of Penang, which a few in the room had been to. But my Penang is the Penang of 1898, and I invoke a place covered in virgin jungle, where elephants are still a form of transport. In this scene, Chye Hoon is about to get married. It is a huge celebration, because Chye Hoon is an independent-minded girl with a fearsome temper and no one believes she will ever find a suitor. But get married she does, in the colourful Nyonya-Baba tradition of the day which left my modern British audience wide-eyed. Afterwards, the members of Monty’s asked many questions. We talked about the Nyonyas and Babas, whom none had heard of previously. We talked also of Malaysia, the real Malaysia, not the one touted on Tourism Malaysia billboards. I was impressed that this group – educated women, some with careers, many who stayed at home, some now pursuing post-graduate studies, and all juggling a host of family commitments – remained late into the night to engage in a culture they had never heard of, in a country some had yet to visit. I took it as a good sign that there would be interest from a Western audience in my multi-cultural novel. Its themes are topical today: the ongoing tension between modernity and tradition, and the invisible cost of the cultural assimilation which some of us must face. In my novel, the characters speak like real-life Malaysians. I mentioned this in a previous blog-post What Does it Cost to Write a Novel?, in which I had said I was unsure about this point of style. A member of Monty’s, a speech therapist, said she loved my dialogue. She especially liked the way I had changed the order of words. She put it very aptly: “Language isn’t just about communication; it also conveys a sense of place.” In a number of novels she had read, the characters had spoken in ordinary English even though the stories were set in foreign lands, and she had felt this sense of place to be missing. Others in the group agreed. I breathed a sigh of relief, because my audience had validated an intuition which I, as a Malaysian writer, have long had. My grateful thanks to Monty’s Book Club; they made the evening what it was, and also helped clarify an ambiguity in my own mind. A few members asked when my novel would be published. Some worried it might not. But it will – because I write to be read, not so that my script remains as bits on a motherboard. When and in what form my novel will be published, I cannot say. But I will work to get it there, even if it means having to start a publishing company. With Lee Su Kim, I share a fascination of things Nyonya and a love of reading and writing. She started writing long before I did, and has had several books published. 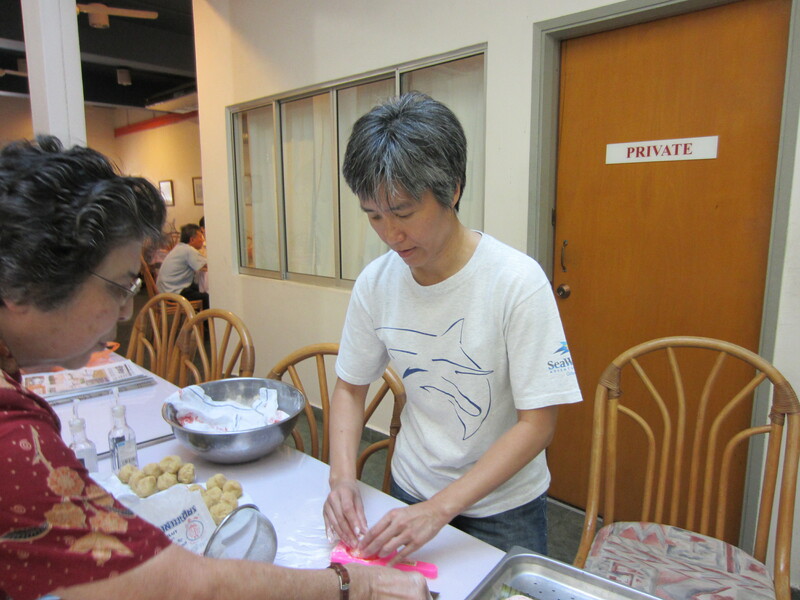 Su Kim also happens to be a founder member of the Peranakan Baba Nyonya Association of Kuala Lumpur and Selangor, and its first woman President. Demonstrating true grit, Su Kim very kindly called me up despite being on her way to see a doctor! Being a Nyonya herself, it’s not surprising that Malaysian as well as Nyonya themes run through her work. The fact that I heard about Su Kim at all was purely down to luck. My aunt happened to attend the launch last year of her latest book – a lovely collection of short stories entitled Kebaya Tales, published by Marshall Cavendish. As I worked my way through the book, I realised how much I enjoyed reading it, which was why I set out to contact her. 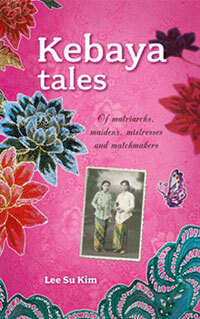 I could see how much of herself Su Kim has put into Kebaya Tales – the book comes across as a labour of love. In addition to stories, she has included personal mementoes: family photographs, shots of the vintage kebayas – the beautifully embroidered blouses in diaphanous material worn by Malay women and Nyonyas – which she inherited from her mother, as well as pictures of the beaded slippers for which Nyonyas are famous. All of these help make her culture come alive to a reader with no previous knowledge of what Nyonya means. 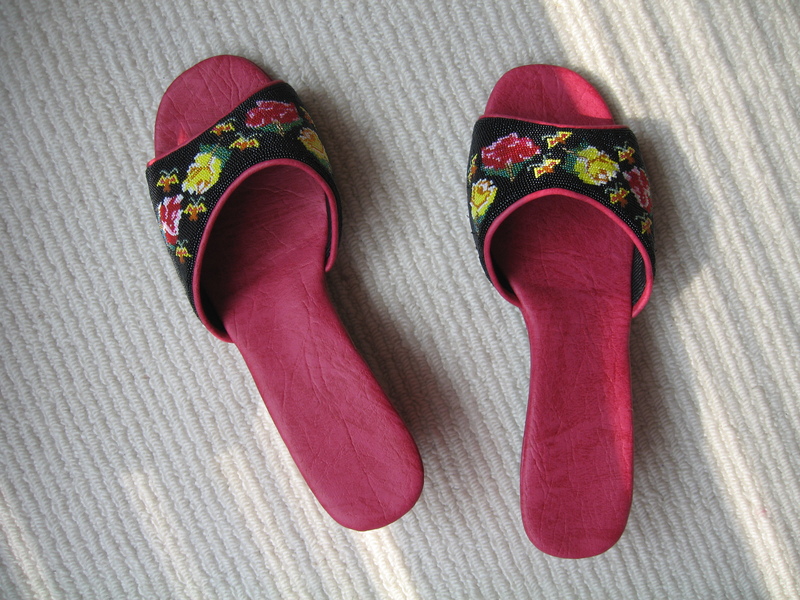 On the subject of beaded slippers, when I was last in Malacca, I bought two pairs of these. (As an aside, Malacca was at one point an important port; see map below to understand its strategic position. Which also explains why it is one of Malaysia’s most historical towns and has a large Nyonya population). To get back to the famous beaded slippers, here’s a photograph of the pair which I gave my partner. You may not be able to see them, but the top of the shoe comprises tiny beads in many colours. The beads are patiently threaded together to create the flowers and butterflies which adorn the black background, itself made up of the same tiny beads. The smaller the beads (which this shoe happens to have), the greater the expertise required, and the greater the patience demanded. At one time, beading was considered a required skill for a Nyonya, one on which a potential daughter-in-law could expect to be severely judged. As for the stories in Kebaya Tales, Lee Su Kim succeeded in drawing me in and sometimes, in shocking me. Her tales contain unexpected and occasionally disturbing twists, but she invariably managed to weave in some or other aspect of Malaysia. A few stories touch on folklore, others on parts of our history which remain unresolved, such as what happened during the war years, yet others contain unspoken beliefs which permeate our culture. However, you don’t need to be a Malaysia expert, because the stories provide easy reading. The collection is also totally self-contained; Su Kim even included brief notes about the Nyonyas as well as ample commentary about their kebayas and sarongs. Your parents in turn will be praised for your good upbringing. I re-read the ditty above many times, always laughing. It amused me to see how miserably I would have failed! Based on the above criteria, I make a lousy daughter-in-law. Praise be to the Heavens. I held my breath. On turning the bright pink mould upside down and giving it a gentle tap, I could barely believe that what I had just fashioned with my fingers would fall out. Yet fall out it did, plopping into my open palm without fuss, its shape intact. You can see the look of utter surprise on my face. I had finally made my first angkoo. If you’re not from south-east Asia, you may well ask what angkoo is and why on earth I would want to make it. In the photograph on the right, angkoos are the orange-red mounds resting on the tray at the bottom. 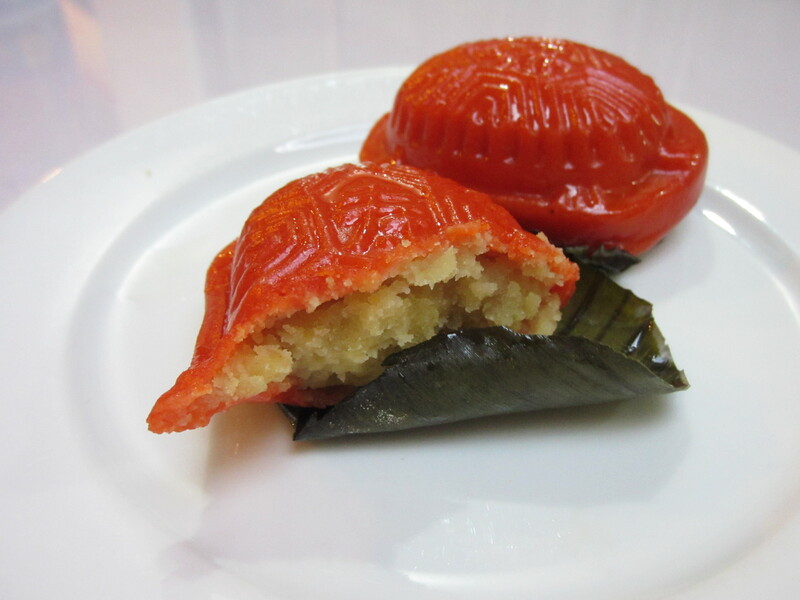 Each angkoo comprises a glutinous rice skin, coloured orange-red and filled with steamed mung beans. Not your cup of tea? You may change your mind once you’ve tasted one: angkoos are sweet and delightfully aromatic, with lots of thick coconut milk and sugar. Why this interest in angkoo? 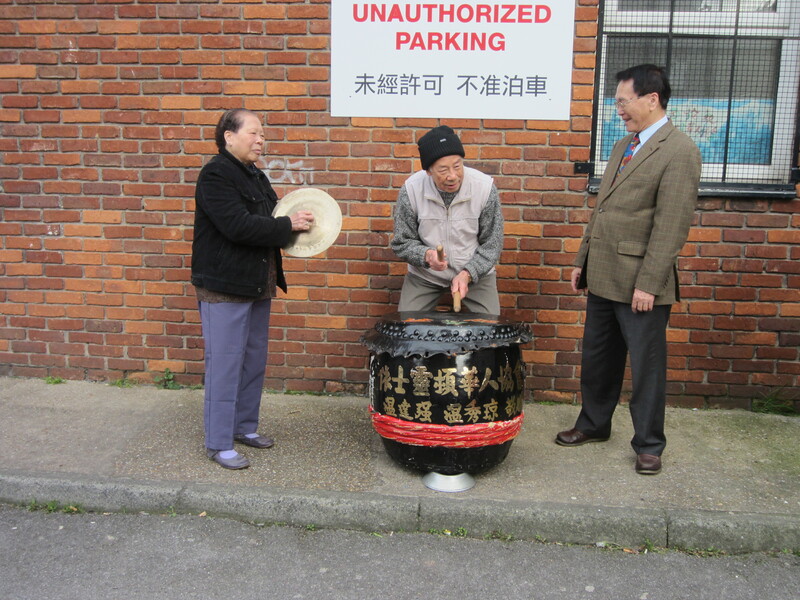 Well, angkoo is a well-known type of ‘cake’ or kueh made by the Nyonyas. It also has symbolic significance, because angkoos were traditionally given by a Nyonya couple to their family and friends when a new baby reached its first month. Angkoo features at key moments in my novel because of this symbolism. It has additional import for my main character, because it is while making angkoo one day that she finally realises what being a Nyonya actually means for her. Because of the role angkoo plays in my novel, I’ve had to follow its recipe in detail, trying to imagine what it would have been like making angkoo in a sweaty olden kitchen. This week, I decided it was time to consult an expert. Who better than my aunt Lorna, who comes from multiple lines of Nyonyas? My aunt’s grandmother was my Great Grandmother, a fierce Nyonya woman, and my aunt’s mother was also a Nyonya descendant of many generations. 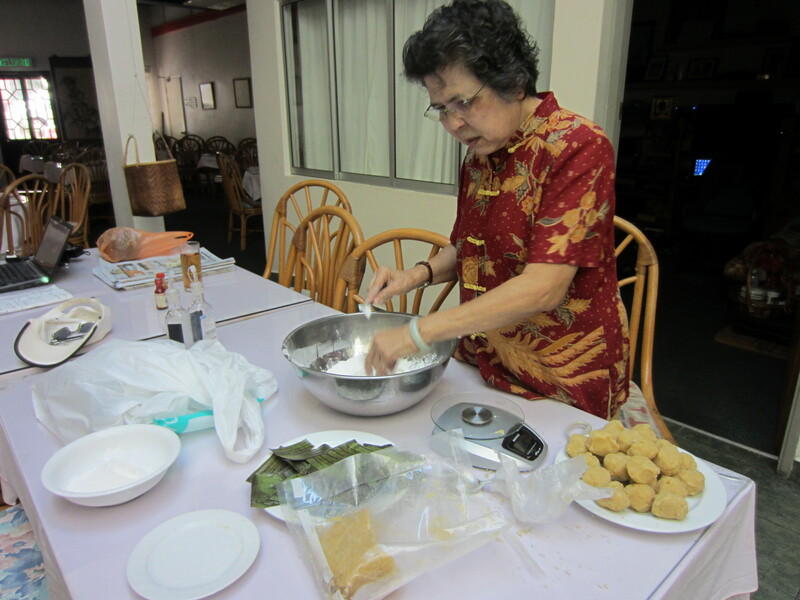 Aunt Lorna runs Sri Nyonya, one of the best-known restaurants in Petaling Jaya specialising in Nyonya cuisine. (Petaling Jaya, PJ to locals, is close to Malaysia’s capital of Kuala Lumpur). I was nervous before we started, uncertain how the day would go. 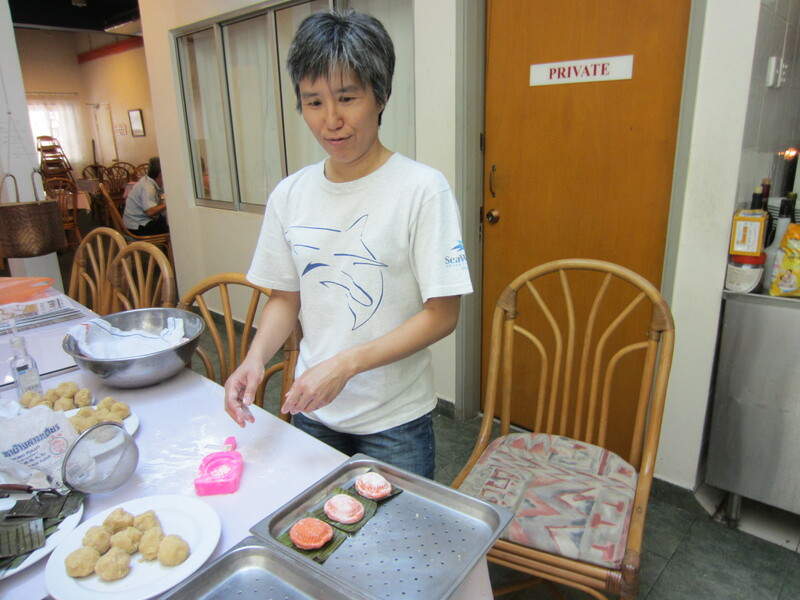 Everyone had told me beforehand what hard work Nyonya cooking was, especially the ‘cakes’ or kueh I wished to learn. For the first few minutes, I stood watching my aunt in awe. By the time the photograph with my stunned face was taken, I had relaxed, because most of the arduous work had been done. I call it arduous, yet it was easier than in the days when my main character was making her angkoos. She would have had to grind her own glutinous rice flour by hand; we bought ours in ready-made packets. She would also have had to chop firewood for the stove and use bellows to control the strength of the fire. Despite our modern conveniences, I can’t say the work was easy. There was much mixing and kneading and steaming. Even though aunt Lorna had steamed and crushed the mung beans the day before, it still took us a couple of hours to make thirty two angkoos. Each angkoo has to be made individually, which means that the amounts for every skin and ball of filling have to be separately weighed. Only thereafter could the fun begin: the shaping of each angkoo into its mould and the ‘knocking out’ of the angkoo. From the photographs, it’s obvious I had to concentrate hard. Aunt Lorna showed me how to flatten the orange-red angkoo skin on my palm, making sure the skin became thin but at the same time, was thick enough to hold its filling. When the skin was properly prepared, I placed a ball of the mung bean filling onto it and slowly pulled at the sides of the skin to close the wrapped ball up. Then, I pushed the ball into an intricately designed mould. The traditional moulds were wooden, but we used a bright pink plastic mould with the characteristic tortoise pattern inscribed. I was told that if I coated the mould properly with glutinous rice flour, the angkoo should simply drop out when the mould was turned over and given a soft tap. Although I understood the theory, it still felt like a small miracle whenever an angkoo fell out with no problem. I always breathed a sigh of relief. My angkoos tended to have wobbly sides, not the clean lines of my aunt’s expert hands, but that didn’t matter, because they all tasted wonderful once they had been steamed. They were a perfect shade of orange-red too – thanks entirely to my aunt, who had mixed in the colouring in judicious proportions. It was only afterwards, in the quiet of the night, that I became aware of the emotions I must have carried during the day. I remembered the joy I felt as we, my aunt and her helper Theresa and I, chatted happily while knocking angkoos out. I imagined my main character doing the same a hundred years ago in her old-fashioned kitchen. She would also have been standing with other women, surrounded by the sound of chattering and familiar aromas, of garlic frying and pandanus leaf steaming. 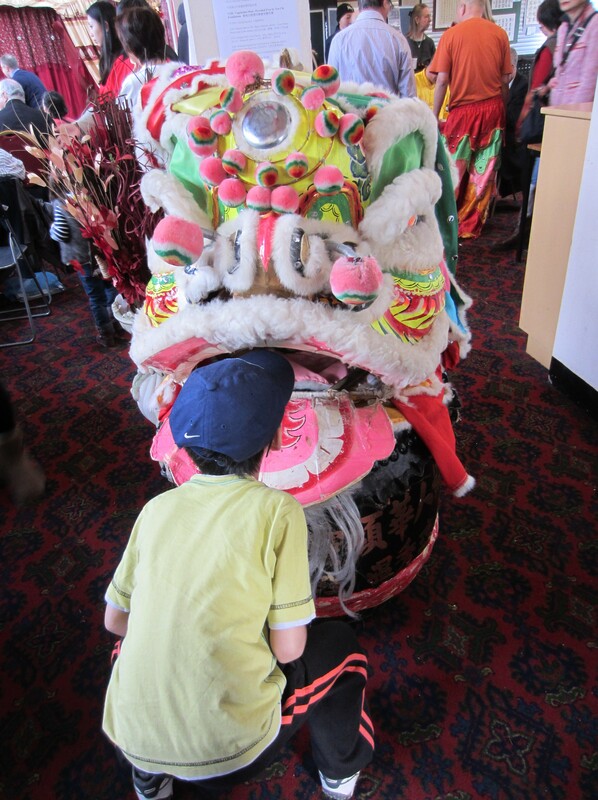 It was in the midst of such activity that she learnt to appreciate her heritage. For me, what began as a research adventure turned into an intense, highly personal event. Making angkoo with aunt Lorna was a privilege, an experience I will never forget.